If NeNe Leakes has a spirit animal it would be a tiger. On season 11 of Real Housewives of Atlanta, we’ve seen the tiger fighting everyone. That includes the cast, who’ve been demoted from friends to co-workers. And crew like the cameraman who dared venture into her closet. What’s hiding in there? NeNe added, “They say we separated now…. I appreciate you tho Gregg for accepting and understanding that being a caretaker is something I’ve never done and I have truly done the best I know how all while making tons of mistakes along the way.” This would include NeNe asking fans to pray for her on Twitter due to Gregg being mean, grouchy and evil in December 2018. Gregg has always been the RHOA husband who is beloved by all, so I’m looking forward to hearing his news. TELL US- HOW DO YOU FEEL ABOUT THESE RELATIONSHIP UPDATES ON INSTAGRAM? 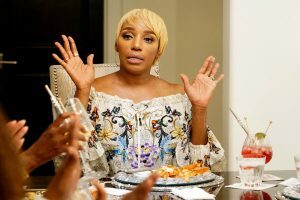 DO YOU THINK NENE IS LASHING OUT THIS SEASON? MORE THAN USUAL?